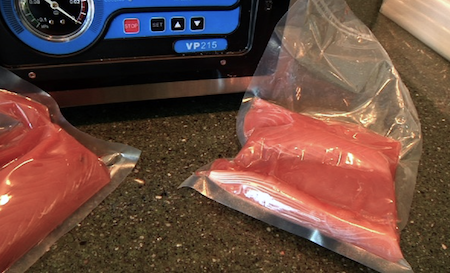 As an avid outdoorsman who lives in a two-person household, we use our vacuum sealer all the time. Half the time I’m sealing up lobsters, fresh-caught fish or some other game that I’ve harvested. The other half we use it to seal up single portions of meat we buy in bulk from places like Costco to save money. For more years than I can remember we turned to our trusty Foodsaver to handle the vacuum sealing. I think we’ve owned three or four over the years, but they have all given up the ghost after two or three years. 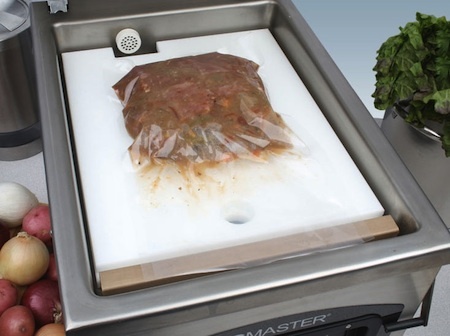 Every time a Foodsaver machine would die, I’d try to force myself to move up to a chamber vacuum sealer but I could never pull the trigger, until now. I finally broke down and ordered a real vacuum sealer. 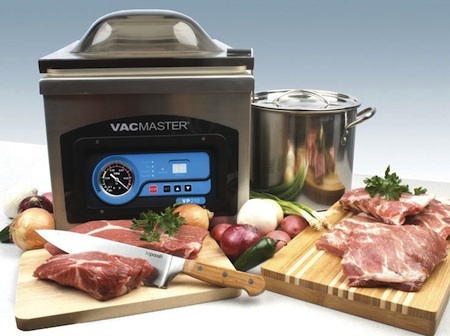 After a bunch of research online I decided on the VacMaster VP215C chamber sealer. A few days later the box showed up and the quality of the unit immediately impressed me. The machine is made out of 100 percent stainless steel and has a massive pump inside. The entire unit has to weigh 80-plus pounds, so you’re going to want to find a good permanent home for it. The corner of my workbench was perfect! Within 10 minutes of unpacking the VacMaster we were off and sealing. The settings are really basic. Just three settings to work with — pump time, seal time and wait time. We went with the factory setting and that seemed to work perfectly. As soon as we got a few bags sealed, the hunt was on to find more stuff to seal. This machine packs flour and coffee down hard as a rock and will crush a large can without a problem. I tried item after item and they all sucked down tight with a perfect seal each time. The ability to seal anything, wet or dry. I used to have to pre-freeze chunks of fish or lobster when I used the Foodsaver so the liquid wouldn’t be “pulled” out of the bag and ruin the seal. The smaller machines pull the air out of the bag and then seal while the air is being pulled out. This means all the liquid is pulled into the sealing resulting in a bad seal. This machine is truly up to professional standards. I have been able to seal bag after bag for more than an hour straight without an issue. Anyone who has tried this with a Foodsaver machine has run into the “overheat” issue where you have to wait for as much as five minutes for the machine to cool down. Not an issue with the VacMaster VP215c, it seals bag after bag as fast as you can load them. The giant vacuum pump and adjustable run times allow you to get all of the air out of the bag for an ultra-tight seal to prevent freezer burn. Your finished product will be sealed as tight as a pack of beef jerky from the store, but you can also turn the time down so you don’t crush softer, more fragile foods. Like many things, the initial upfront cost of the machine will sting a little, but if you use the machine regularly you’ll recoup your money in just a few years’ time. The machine itself is clearly built to last so you can forget about buying a new $250 unit every couple of years. The biggest savings you’ll see will be in the cost of bags. Foodsaver bags and rolls are very expensive. Not the case with the VacMaster. I ordered 1,000 8-inch x 12-inch bags for less than $60 or just $.06 per bag! After owning the VacMaster machine for just a month now I can honestly say I that I wish I had pulled the trigger sooner. I’ve sealed hundreds of bags of fish, a couple dozen lobsters and a bunch of chicken and steak without so much as a hiccup. The machine is built like a tank and I’m confident it will last for many years to come. If you’re interested in getting your own, check out VacMaster VP215 or supplies.